Confession time: I tend to sweat a lot. My body gets hot really easy (which is often since I live in SoCal and it is pretty much always warm here), plus whenever I get nervous or anxious (again, often), I sweat. So finding a decent vegan deodorant that works well is super-important to me since I'm such a sweaty broad. In the past, I've used Herban Cowboy’s and Nature de France’s Le Stick deodorants and have had moderate success with those. I've unfortunately found that those and most natural deodorants just don’t offer the same protection as my pre-vegan, chemical-laden deodorant, which isn't just filled with nasty, bad-for-you ingredients, but most likely also contains animal bi-products and is cruelly tested on animals. It goes without saying that I would rather use a slightly less effective vegan deodorant than a bad-for-you and a bad-for-the-animals deodorant. Though Herban Cowboy and Nature de France’s deodorants were the best vegan “stick” products I’d found, I've always been on the search for other deodorants that work more effectively and eradicate all smelly odors. Luckily, North Coast Organics was gracious enough to send me their deodorants to put to my sweat test! This independently-owned company also makes lip balms, which they also sent me. All of their products are vegan, handmade and organic. Their ingredients are pure, natural and do not contain any icky chemicals. You can even pronounce them all! The first thing that struck me about the products was the edgy packaging…I am a sucker for skulls, so I was immediately drawn to the “Death by Lavender” deodorant, especially since it proclaimed it was an “elite assassin of odor”! It has a strong lavender smell, which I love! After being in contact with my skin a few moments, the deodorant melted just a bit and went on smoothly. I really, really loved the lavender smell, which lasted all day! It did a great job at keeping me smelling fresh and feeling clean! 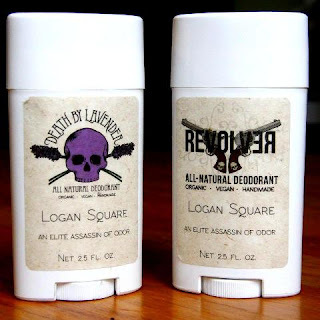 The next deodorant I tried was the Revolver deodorant, scented with cedar wood, cypress and clary sage. I suppose this is the more “manly-smelling” deodorant they make, but I love manly-smelling deodorant! In fact, I usually prefer it over flowery, feminine deodorants (this explains why I love using Herban Cowboy’s deodorant so much!). This deodorant’s scent was more subtle than Death by Lavender but just as pleasant! I felt this deodorant was a bit stronger than Death by Lavender and worked better to totally eradicate odor (though both contain basically the same ingredients, so maybe this was all in my mind!). I really liked both deodorants, but while they worked well they didn’t completely get rid of all odor. Believe me, they did an admiral job, and I will definitely continue using them, but I still noticed a bit of stinkiness when working out hard or when I sweated a lot in hot environments (like that one March weekend where it was like 85 degrees…ick!). For every day wear, though, these worked really well. As an added bonus, I also got some lip balms to review. The two kinds made by North Coast Organics are WMD and LSQ. WMD was my favorite, with essential oils of cinnamon, ginger and tea tree. It went on smoothly and really gave my lips some much-needed moisture! I keep it by my bed now and put it on every morning and night! The LSQ was a bit rougher and didn't go on as smooth, but I did enjoy the scent of peppermint, spearmint and tea tree from its essential oils! North Coast Organics makes solid vegan, organic and natural products. I love the homemade aesthetic of the products, the clever packaging and the fact that they are all-natural and vegan, but I really love that they WORK! I found that though the deodorants may not eradicate 100% of odors on especially warm days or during tough workouts, they still do a pretty amazing job 90% of the time, which is more than I can say for most all-natural deodorants! North Coast Organics products can be found in select stores or ordered from their website!